On the ninth anniversary of the sentencing of Palestinian leader and lifelong struggler Ahmad Sa’adat in Zionist military courts, the Campaign to Free Ahmad Sa’dat emphasizes the critical importance of building the popular, political and media campaign to free Palestinian prisoners, central to the Palestinian struggle for liberation. Ahmad Sa’adat, the imprisoned General Secretary of the Popular Front for the Liberation of Palestine, was sentenced to 30 years in occupation prison by a Zionist military court – one day before the launch of “Operation Cast Lead,” the infamous, brutal Zionist aggression on the Palestinian civilian population of the Gaza Strip. 1) We salute the leader Ahmad Sa’adat, who stood on this day before the Zionist court to reject its judgement and affirm its illegitimacy, while reaffirming the legitimacy of the Palestinian people’s struggle for liberation. 2) This occasion also revealed the magnitude of the disaster inflicted upon the Palestinian people by the right-wing Palestinian leadership, as demonstrated by the complicity of its officials and security agencies – primarily the intelligence and preventive security service – in the kidnapping of Sa’adat and his comrades. This act led to the violent invasion of Jericho and the arrest of Sa’adat and his comrades by the occupation forces. This crime has been intensified and repeated until it has become a symbol of the actions of the Authority and its security organs. 3) This crime against a Palestinian leader will not be forgiven or forgotten. Those who are responsible, the occupation and its servants in the security agencies, must be held accountable by the Palestinian people and their national liberation movement. 4) We emphsize the call of Ahmad Sa’adat to all forces, organizations and solidarity movements to build the campaign for freedom of the child prisoners, the cubs and the flowers in the prisons of the occupation. Their freedom and the freedom of the sick prisoners are a national priority for the Palestinian people. 5) In the current situation following the declaration of imperialist U.S. president Donald Trump regarding the city of Jerusalem, the continued mass mobilization inside Palestine, in the diaspora, and its support on the broadest Arab and international level is necessary and must be strengthened and expanded, toward a comprehensive uprising, eliminating the Oslo accords and all of its commitments and launching a new phase in which the energies and potentials of the Palestinian people are invested in confronting occupation and its schemes. Freedom for Ahmad Sa’adat, his comrades, and all Palestinian prisoners in Israeli prisons! 1. The Campaign to Free Ahmad Sa’adat urges all to participate widely in the campaigns to Free Ahed Tamimi and the over 300 child prisoners held in Israeli jails. There are protests, social media campaigns, legislative calls to action – and now is the time to mobilize for all of the brave flowers and cubs imprisoned by the Zionist occupation. Indeed, since the Trump declaration, there have been over 170 children arrested by occupation forces. 2. 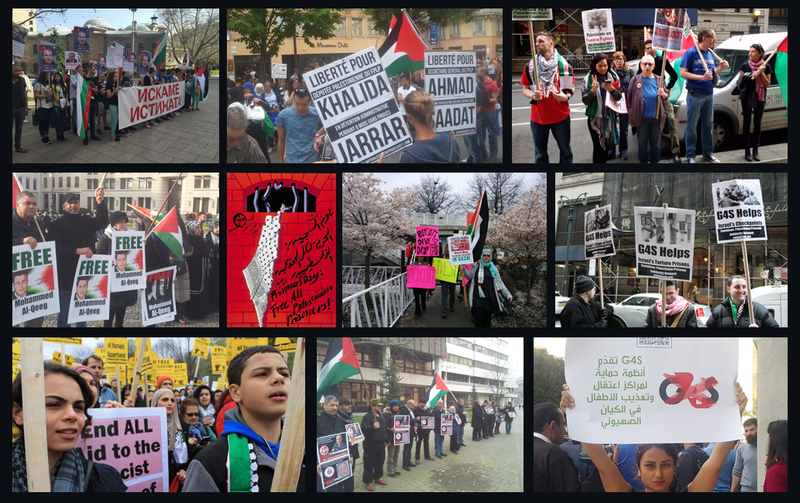 The Campaign to Free Ahmad Sa’adat urges the broadest mobilization for Jerusalem and Palestine – and their imprisoned leaders, the Palestinian political prisoners. Hundreds of thousands have already taken to the streets around the world; the pressure must continue in order to build support for the growing uprising and mobilize pressure on governments to end their complicity, silence and support for the occupier. 3. The Campaign to Free Ahmad Sa’adat urges, on this ninth anniversary of the sentencing of Sa’adat, the escalation of all campaigns for boycott, divestment and sanctions against Israel on the cultural, economic, military, academic and diplomatic levels. Sa’adat spoke to the military court upon his sentencing: “In defense of the justice of our cause and in defense of the legitimate struggle of our people against the occupation, I refuse to recognize the legitimacy of your court or to legitimize your occupation or to stand before either of these.” The comprehensive boycott of Israel can and must back up this principled position at an international level.